My boyfriend named this pot holder from the shape. It's of very simple and easy pattern, so I explain the way to make it. 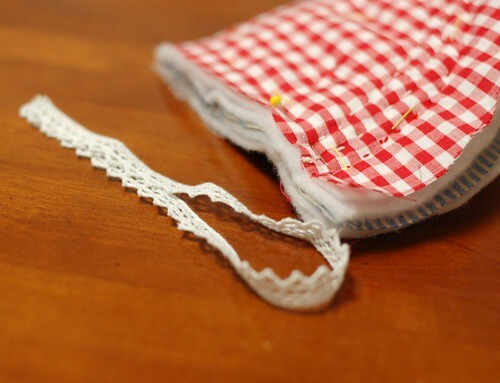 the outer fabric, the inner fabric, batting, lace or string(to hang it), and tape or bias tape(for the edge). The pattern is a half circle of 11.5 cm (or 4.5 inches) diameter. Cut the fabrics and batting with 5mm allowance for each. I put double layer of batting because it is thin. Put them together and baste it. Quilt it. I used Sashiko cotton embroidery thread and I embroidered also some flower motifs. 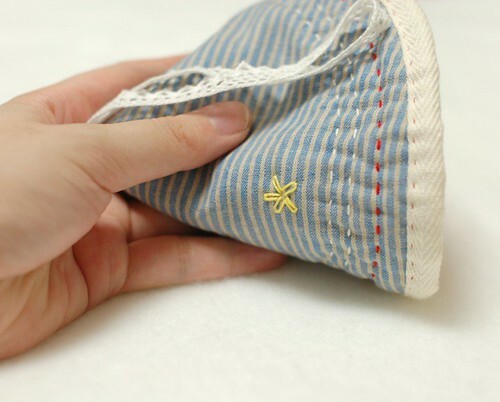 Fold it in half and put the lace on the top like the picture below. 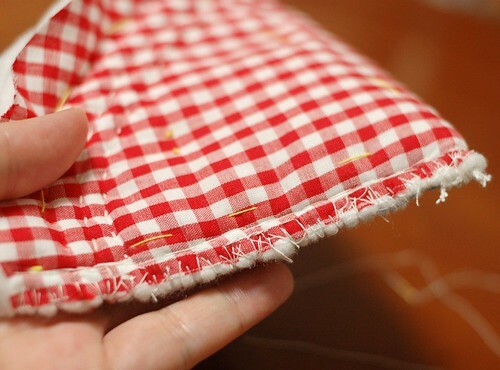 Be careful to put the inner fabric(red gingham) outside. 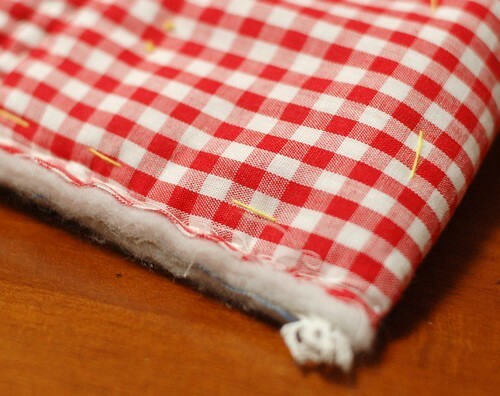 Sew it well. 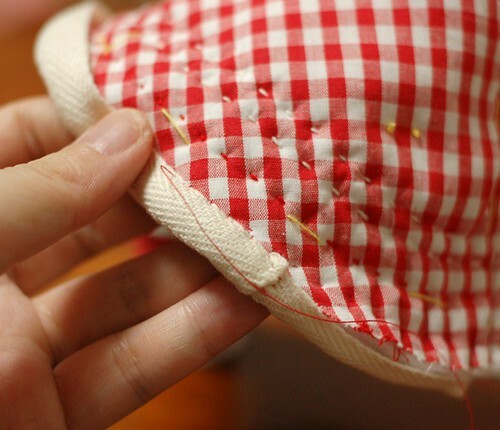 If you sew it roughly, you can see the thread from the outside because of its thickness. 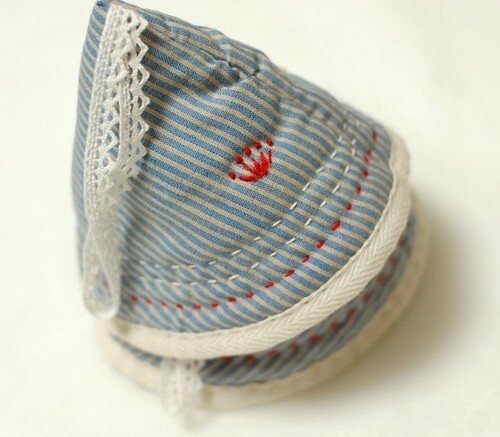 So I sew it two times and also sew it with whipstitch to avoid fraying. 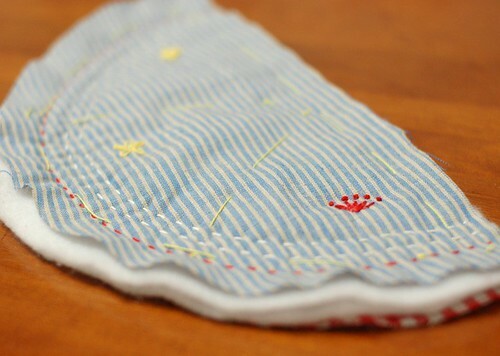 Cut the cotton tape as the line of the edge and put it at the edge and sew it. At the end, Fold the edge and pile it on the beginning. 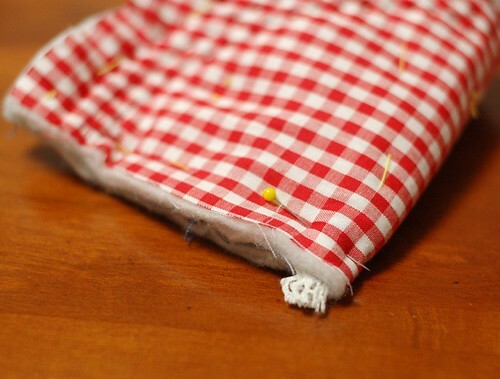 Then turn it out and fold the tape in half and sew it with blind stitch. Use it like the picture. I made two pot holders with different stitches. In the rainy Sunday night, I made these in three hours. I was happy in the sound of the rain, sewing my favorite stitches. They are lovely, Mai! Thank you for showing how to do it. I'm beginning to love doing hand sewing. The simplicity of your creations are inspiring. I am trying to declutter my apt and simplify my surroundings. That is why I find myself pulled to your style. Doomo Arigato Gozaimasu. 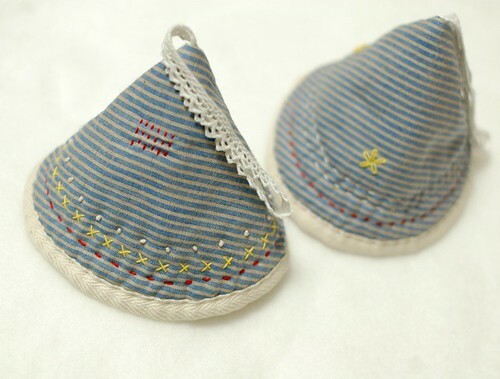 These are awesome - so simply, functional and hella cute : ). Thank you for such a fab tutorial as well! Grazie mille! Thank you very much! I love simple and cute things. Cutest pot holder EVER! Just darling! I'll be linking. Mi piacciono moltissimo i suoi lavori,complimenti! Thanks for sharing this tutorial. I always thought I need a sewing machine to sew something like that but all your hand sewing craft seem so pretty & neat like they are done using sewing machine! I really enjoy reading your blog! i have just move and am tring to declutter also. why did i not do it when i was packing??? I tried but time crepped up and i had to stop and just pack. so know as i try and un pack it am tring to declutter. anyways i really lkie your blog. you come up with some very interesting things. Thanks for sarubobo's tutorial. I've two in my blog. 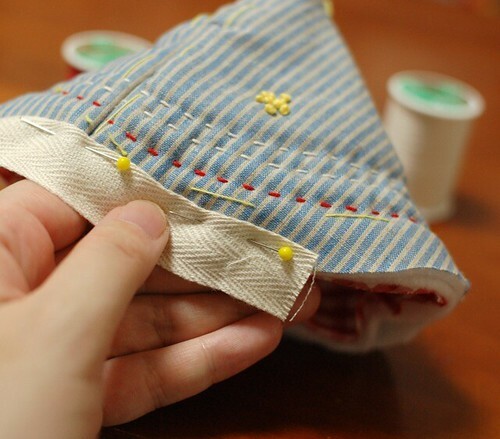 It's easy to sew by hands. Let's try together! Your sarubobo are very cute. Mai these "fairy hats" are so lovely! I adore your clever tutorials. I made one of your patchwork button pouches (pictures on my blog) and love them (except no buttons on mine as don't know how to do buttonholes yet..!) Thank you for sharing your enthusiasm and your skill with us! 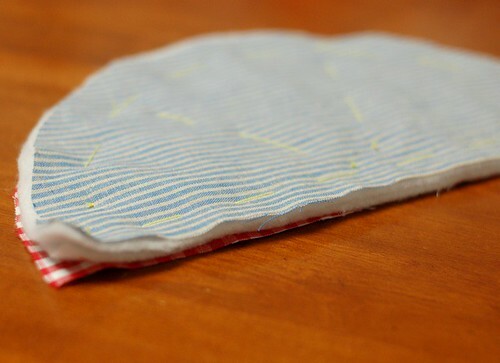 This potholder is so cute. 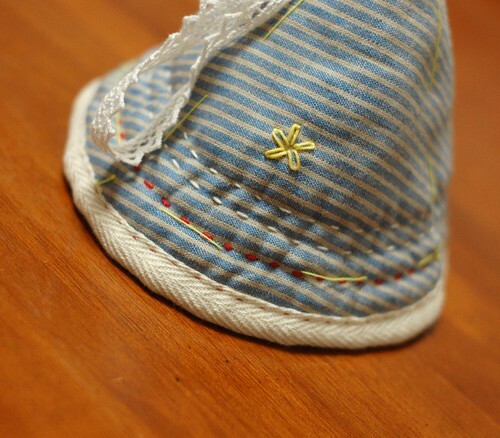 I love the hand sewing. I am so happy to have found this blog! Thank you very much. (* v *)!!!! 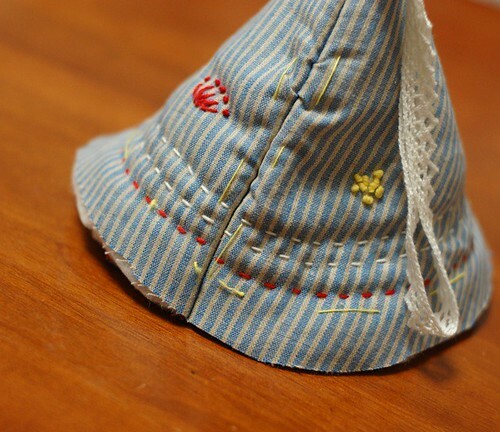 Thanks for the idea.. heres a link to the one I made..
For a few hours I have been reading and looking for How to make a Fairy hat pot holder and is amazing and disturbing how many blogs related to generic viagra are in the web. But anyways, thanks for sharing your inputs, they are really helpful. 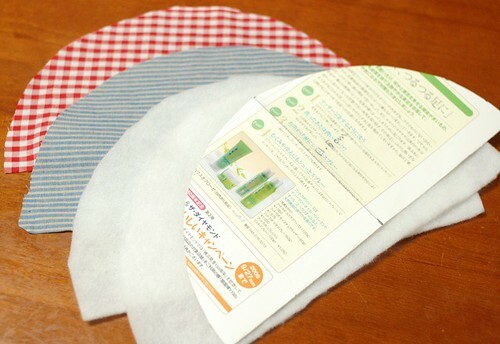 I just made two pot holders fallowing your intrutions. Tahnk you for sharing.